Dr. Robert Judd is shown with last year’s program from the Boshell Diabetes and Metabolic Diseases Research Program’s Annual Research Day. This year is the 10th year of the event on Friday, March 3 at the Hotel and Dixon Conference Center at AU. The event brings more than 175 researchers from throughout the Unites States together for a day of learning and sharing information about research related to diabetes and the role of obesity in its development. 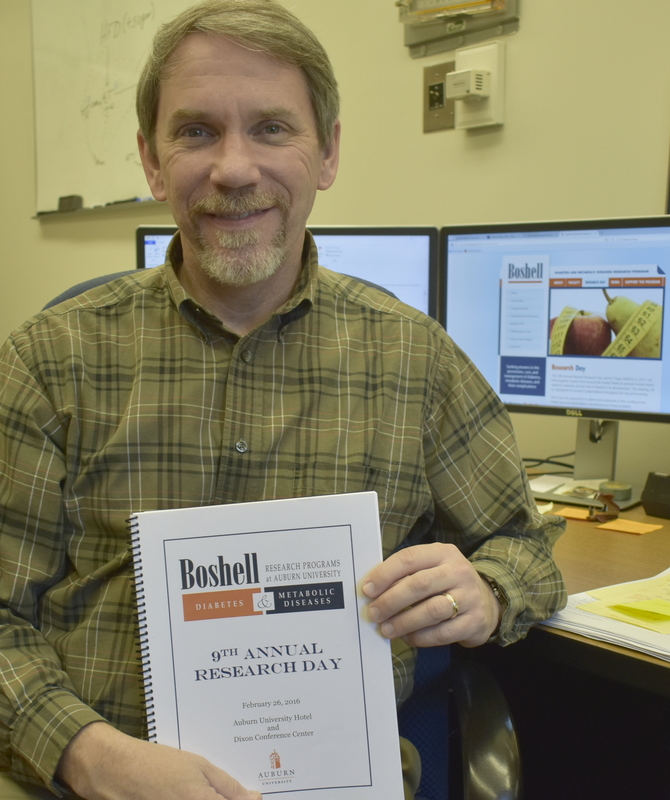 The Boshell Diabetes and Metabolic Diseases Research Program at Auburn University is holding its 10th Annual Research Day Friday, March 3 at The Hotel at Auburn University and Dixon Conference Center. The event, which has grown each year, brings more than 175 researchers from throughout the Unites States together for a day of learning and sharing information about research related to diabetes and the role of obesity in its development. “We have three widely renowned speakers for this year’s event,” said organizer Dr. Robert Judd, a professor in the Department of Anatomy, Physiology and Pharmacology at the College of Veterinary Medicine. Dr. Judd also serves as chair of the Boshell program at AU. The mission of the program is to enhance the opportunities for diabetes research at Auburn by facilitating cross-disciplinary scientific discussion, supporting the study of new ideas, fostering the development of investigators new to the field of diabetes, and expanding, the overall base of diabetes investigation at the university, Dr. Judd says. Specifically, these investigators are addressing many facets of both types 1 and 2 diabetes, with particular focus on the cardiac, neurological and metabolic aspects of the disease. This year’s keynote speakers include Dr. E. Dale Abel, chair of the Department of Internal Medicine at the University of Iowa Carver College of Medicine. Dr. Abel will give the keynote address. Dr. Sabrina Diano, director of the Reproductive Neurosciences Group at the Yale University School of Medicine is the plenary lecturer; and Billy Mills, Olympic gold medalist is the banquet speaker. Registration for the Research Day is open through Friday, Feb. 24. The event is free for Boshell program members, and $125 for nonmembers. Deadline for abstract submission is Monday, Feb. 6. Registration and additional information, including an event itinerary and travel and lodging information can be obtained from the Boshell Diabetes and Metabolic Diseases Research Program web site at: www.auburndiabetes.com. Dr. Abelis is the chair and department executive officer of the department of Internal Medicine, director of the Fraternal Order of Eagles Diabetes Research Center, director of the Division of Endocrinology & Metabolism in the Department of Internal Medicine at the University of Iowa and head of the Interdisciplinary Diabetes Clinic at Iowa River Landing. He is a professor of medicine and biochemistry and currently holds the John B Stokes III Chair in Diabetes Research. Prior to moving to the University of Iowa, Dr. Abel was chief of the Division of Endocrinology, Metabolism and Diabetes and senior investigator in the program in Molecular Medicine at the University of Utah where he held the H.A. and Edna Benning, Presidential Endowed Chair in Diabetes and Endocrinology. Dr. Diano is a professor in Departments of obstetrics, gynecology and reproductive sciences, neurobiology and comparative medicine at the Yale University School of Medicine. She is also part of the Integrative Cell Signaling and Neurobiology of Metabolism, and Interdepartmental Neuroscience Program at Yale. She graduated with honors from the University of Naples “Federico II”, Naples, Italy, and conducted her post-doctoral studies at Yale where she became faculty in 2000. Her research focuses on CNS (hypothalamic) mechanisms relating to the regulation of energy homeostasis, with emphasis on hormone action in the hypothalamus. The results of her research have important implications for understanding the pathogenesis of metabolic syndrome, obesity and type 2 diabetes, disorders that are the leading cause of morbidity and mortality in the U.S., and the developed world in general, with the highest financial burden on the national economy. Mills is the only American to have ever won the Olympic gold medal in the 10,000-meter run. A Lakota Sioux raised in one of the poorest communities in America, the Pine Ridge Indian Reservation in South Dakota, Mills was orphaned as a young boy, facing prejudice and cultural discrimination most of his childhood life. It was through a running scholarship to the University of Kansas that he was able to leave the reservation. While in college, Mills accepted a commission as an officer in the U.S. Marine Corps, which allowed him to cultivate his winning spirit and rich heritage. He began by running 30 miles a week and eventually worked up to 100 miles every week. Basic training and an excellent track and field program helped Mills qualify for the 1964 Olympics in the 10,000-meter run and the marathon. His victory in the 10,000-meter run is often called one of greatest upsets in Olympic history.